We have a winner! Mark Nowning is the winner for January. Thank you for sharing your Route 66 stories from Ludlow. A copy of Travel Route 66 will be arriving in your mailbox soon. Lets keep the stories coming. In the coming weeks we will share a few stories from some international fans of Route 66, and from a former Edsel dealer. Rhys Martin, one of the new faces in the Route 66 community, has a most interesting blog that I highly recommend. His most recent post is a poignant reflection on his brief association with Laurel Kane, the proprietor of Afton Station that recently passed away. The blog post can be read by following this link. Rhys and his charming wife Samantha represent the dawning of new era on Route 66. They are among some of the first American enthusiasts that lack a connection to the road when it was still a designated U.S. highway. The folks in Holbrook are gearing up for the next Route 66 festival this June. Once again the event will feature the very popular tour along Route 66 through the Painted Desert National Park to the ruins of the Painted Desert Trading Post. I will keep you posted on updates as they become available. It has been confirmed that the Route 66 Association of Kingman will be hosting Cinema Under the Stars at this years Chillin on Beale. This fun, low key, old fashioned event takes place on the third Saturday evening of each month, April through October. Bring your chairs and cameras. Enjoy a great cruise night in the historic district, and when the sun goes down, a classic movie filmed in Kingman or along Route 66. As Ramada Kingman moves forward with plans to become the cities first full service Route 66 resort, they are adding some polish to the Kingman area tour packages introduced at the first of the year. Other tours are planned, including an affiliation with internationally acclaimed Pink Jeep Tours which will follow soon. This is the official link for the hotels website and packages page. To wrap up this mornings post, I have a little something from Ron Hart of the Route 66 Chamber of Commerce who recently shared this item with me. 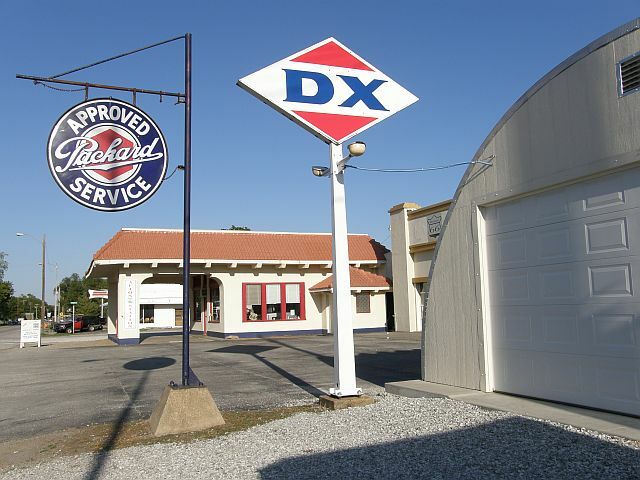 If you have ever wanted to establish a Route 66 business, or eight businesses, this property might be exactly what your looking for. 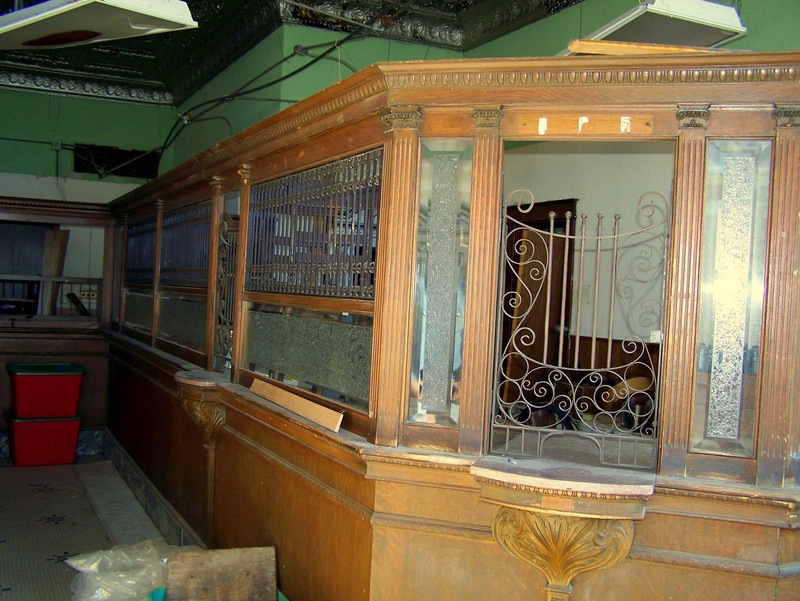 This photo is of the interior and the original bankers cage. All I can say about this is wow. Have you ever wanted to own a bank? Or an Apartment/Bed and Breakfast? How about a fully-equipped multi-bay garage? Or maybe a big Showroom? How about having all of the above, facing Route 66? The Route 66 Chamber of Commerce has learned that the old ‘Miners Bank’ building in Carterville, MO. (between Carthage and Webb City, near Joplin MO.) is coming-up or sale, and the Chamber wants to find a ‘Roadie’ to own this place that is in excellent condition. This building is in it’s original condition, except for the newer windows. After it was the bank that catered to the lead and zinc miners, it later became Carterville’s Town Hall. The addition on the right was the Fire Station, and the multi-bay garage is attached. The second floor is all original and has a number of apartments. The building is just across Main Street from the ‘new’ fire station. I forgot to mention that the rear area of the Bank was the city judge & Police Chief’s office and was the Carterville Police station….complete with two cells for the ‘miscreants’ ! Lots of history here. The fact that there are some apartments to rent, an established business in the old Fire Truck bay and the 7-bay commercial auto repair business….means that there would be enough rental income coming-in to make the payments with money left over for restoration. Plus, you would have a 1000+ square foot living quarters on the second floor with all the appliances, etc. overlooking Route 66 so one could move right in! Too much for one person to handle? ….Form a ‘coalition’ of investment, hands-on partners!